After a night under the vintage neon of Boise’s Cabana Inn, I finally emerged from beneath the sheets to start my third day on the road. Today’s leg would take me across the Oregon state line and into the immense canyon cut by the Columbia River. Portland would be waiting at the end, a destination in its own right. With my limited time, the largest city in Oregon would have to wait for its own trip. After Portland, only a quick run down I-5 and over to McMinnville remained, where my buddy waited with a cool 6-pack to welcome me to his new home. I broke camp at the motel and headed downtown for a quick breakfast before heading out on the road. I’d have two full mountain ranges to traverse before I hit the coast, so after a strong cup of Boise chai and a full tank of gas, I hit the highway with a mission. Just over the Oregon state line on I-84, looking towards a bend in the Snake River. Ahoy there! I sound the horn as I pass the sailing vessel Chance, presumably headed for the Pacific. The Oregon state line whizzed by, and on the other side of the twisting Snake River, I found a route that began scaling the fabled Blue Mountains through a gorge. These mountains are lower in altitude but just as rugged as the Rockies I had left behind. During the era of America’s overland trails, these mountains were a major obstacle on the road to the Oregon country. Their steepness and fearsome reputation for being totally inhospitable meant they needed to be tackled before the onset of winter, pushing wagon trains that lagged behind the rest to their breaking points. Settlements were limited to a few homesteads and way stations, but most of the route was (and still is) nothing but western wilderness. 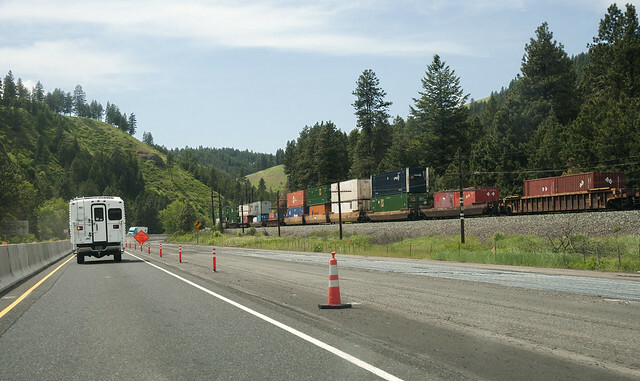 Interstate 84 now shares this mountain route with the Union Pacific Railroad, as the rough country dictates the path and room for infrastructure. Driving I-84 through the Blue Mountains. 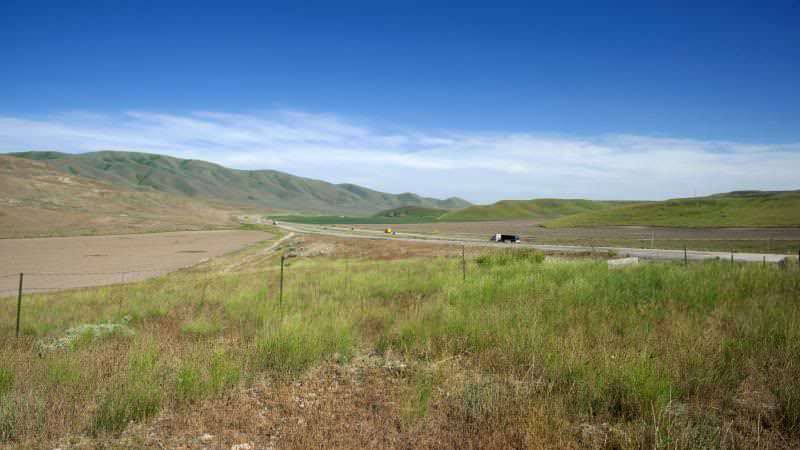 Just east of Pendleton, the road crests the mountains at a place called Emigrant Hill. 160 years ago, this is where wagon trains would finally exit the Blue Mountains, giving their drivers the first view of flat land they’d seen in weeks. Here the trail plummeted off of the ridge toward the valley below, sometimes at precariously steep angles. I took an exit off of I-84 just after the ominously named Deadman’s Pass, and found a two-lane route called Old Emigrant Hill Road. This path follows the original route of the Oregon Trail, descending down the crest of the Blues a few miles away from the spaghetti noodles of I-84. The road snakes back among a few homesteads and cuts long ‘S’es into the side of the ridge, sneaking in and out of the dense trees closer to its base. This old road loses over 2,000 ft. (609 m) of elevation in only two miles (3.2 km). I pulled off the road at a well-placed turnout and took in the view. Panoramic view from atop Emigrant Hill. The Cascades are still hidden in haze beyond the grassy valley below. Click to view this image larger. Before heading out, I investigated a few tracks I had seen from the other side of a hairpin turn. 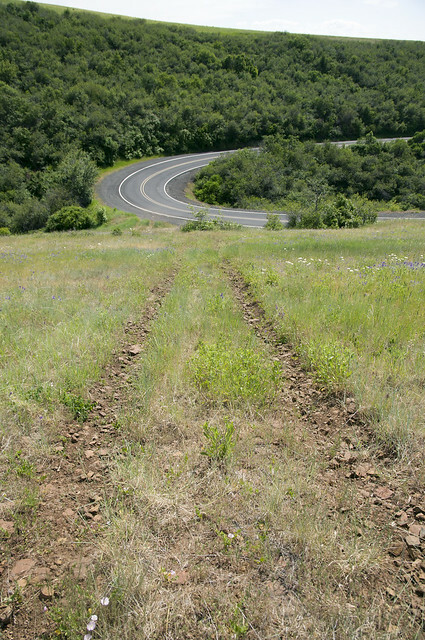 These tracks led right down a slope, bypassing the modern two lane road. They did not appear to connect to anything, and seemed to be just slightly too wide to be modern vehicle tracks. The profusion of trail remains in the nearby forest has led me to believe these are, in fact, original Oregon Trail ruts. As a Millennial, I remember a certain computer game which will be familiar to many of my vintage where one travels this trail, and when faced with a steep hill, the player was given a choice. Would you cruise down the hill as usual, lock the primitive brakes on your wagon, or use ropes to lower it down trailing an anchor log? All of my elementary school training and experience told me to do one thing with my wagon. I’d lock the wheels and continue. After this, I headed down the mountain, past sleepy rural houses and old quarries to the town of Pendleton, where I rejoined the Interstate. Just a few miles ahead of me lay one of the most tremendous sights I have ever laid eyes upon: the Columbia River. This river is the lifeblood of the Pacific Northwest, giving its residents drinking water, hydroelectric power, recreational opportunities, and commerce – it cuts the only navigable route through the Cascades and allows shipping traffic as far inland as Lewiston, Idaho – 465 miles from the sea. It is as far across in places as America’s most famous river, the Mississippi, due to the huge dams built on the river in the 1930s and 50s. It is truly a sight to behold – I was initially under the impression that the huge river in front of my Hyundai was actually a long mountain lake as I would find back home in Colorado. This ‘lake’ of a river ended up guiding me all the way into Portland, but not before it dispensed with more than eighty miles of jaw-dropping natural beauty. Entering the Gorge near Pendleton. 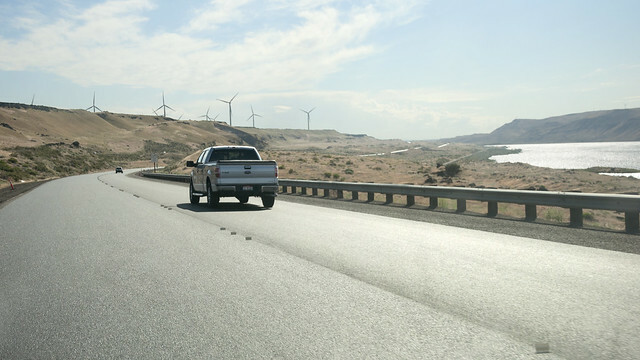 The wind turbines on the hill take advantage of the canyon’s wind tunnel effect – the elevation drop and width of the canyon can generate winds of more than 35 MPH (56 km/h). 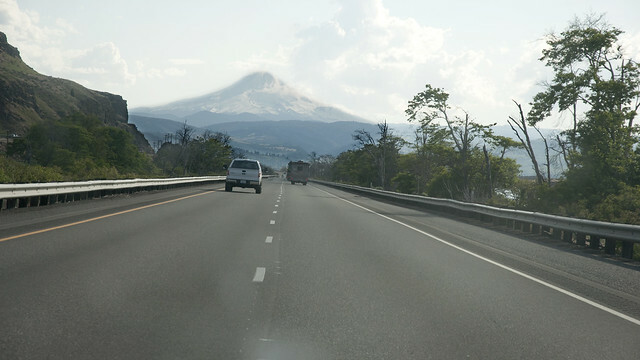 Mount Hood comes into view along a curve. It’s technically an active volcano, although the odds of it erupting in any capacity in the next 30 years are very low – between 3 and 7%. I had been looking forward to this drive ever since I left Colorado, and the Gorge did not disappoint. As I drove farther into the Cascade Mountains, the hills along the river grew taller and steeper until the towns along its banks were clinging on to the sides of the canyon. The road weaved its way past the tiny towns of Arlington and Rufus, every turn and corner a vista on the rest of the gorge. This highway was cobbled together from bits of routes dating back to the 1870s, widened and realigned over the decades to accommodate modern vehicle traffic. The river, too, had changed drastically over the last 80 years. Until the 1930s and 40s, the Columbia was a fast-flowing Western river, wide enough for everything from the fur-trading voyageurs to early steamboat traffic but not much else. It was dangerous, too. The steep drop in altitude through the canyon and the underlying geology created several sets of waterfalls – cascades so dramatic they gave the surrounding mountain chain its name. At the Dalles, the river squeezed itself through a channel as narrow as 75 feet (23m) in places, plummeting over 70 feet (21m) down over the hard volcanic basalt of the base rocks. The spring thaw would bring with it a rush every year to take advantage of the higher water levels in the Columbia. The falls would be passable for only a few months out of the year. 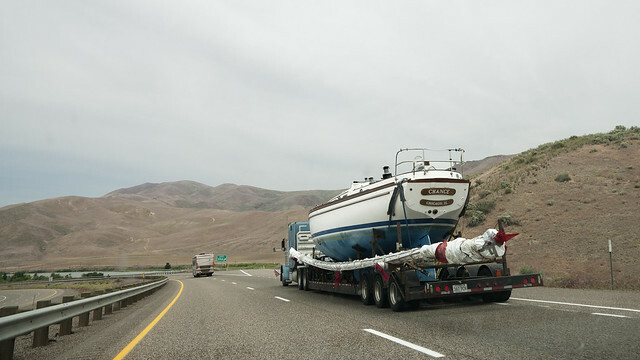 At all other times, traffic would either have to roll the dice and shoot the rapids (arguably the best part of playing Oregon Trail as a kid) or remove the vessel and its cargo from the water and carry it up the steep banks and around the rapids – an act known as ‘portaging’. This practice continued until the construction of navigation canals in the late 19th and early 20th century, such as the Celilo Canal and the Cascade Locks farther down river. These canals were made obsolete starting in the 1930s as a massive public works project got underway. 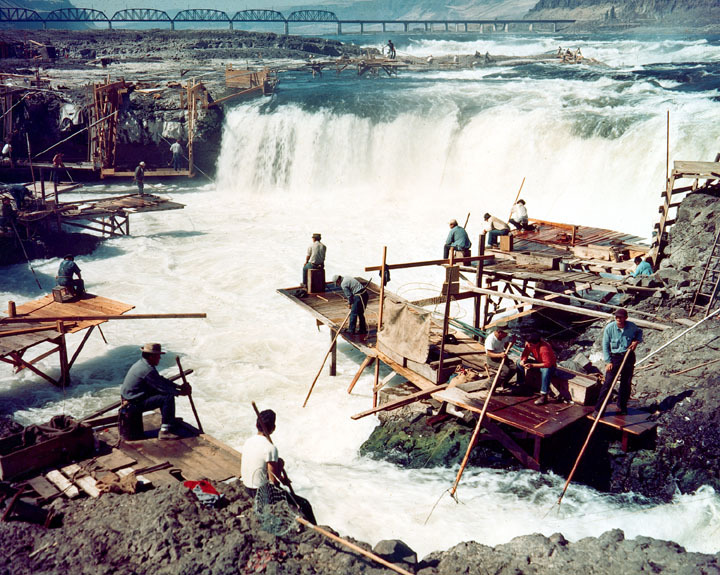 FDR’s New Deal proposed a system of large dams on the Columbia for both power generation and river navigation. The slackwater created by the dams would submerge the many dangerous rapids on the river and make it easy to cruise up in any kind of vessel. By the 1970s, fourteen dams harnessed the rushing waters of the Columbia, from its upper reaches near Revelstoke, BC, to the immense Bonneville Dam 40 miles east of Portland. I couldn’t help but stare at these leviathans as I passed them, holding back just enough river to create an awe-inspiring display of brute power as they guided the whole of the Columbia through their spill ways. I finally stopped my canyon gawking in the town of Hood River, pulling into a gas station for a quick map check. Almost immediately, a man walked up to my car, pulled open the fuel door, and knocked on my window. Startled, I asked what this stranger was doing to my friend’s car. He replied by asking me if I needed gas, and pointed out that this practice of ‘full service’ was state law in Oregon – I legally could not pump my own gas. Oregon is one of only two U.S. states that still mandates this, the other being New Jersey. Reasons for keeping the occupation of gas jockey alive range from a desire to retain minimum-wage jobs to a concern that regular, untrained drivers will simply light themselves on fire if unsupervised. 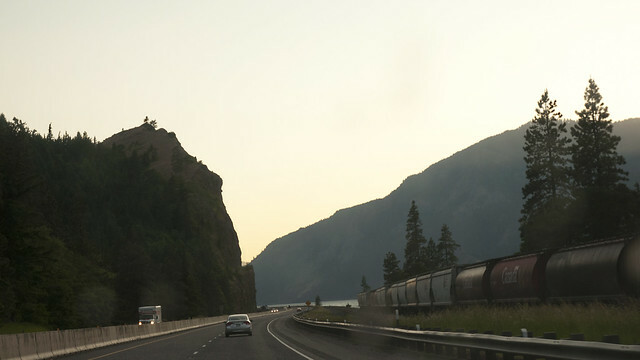 Hood River is known for producing some of the Northwest’s best beer. Just around the corner from the well-known Full Sail brewery is its much smaller cousin, the Double Mountain, which was founded by former Full Sail employees. Inside, I found not only a fantastic Belgian Dubbel ale called Sacre Bleu, but one of the best compliments to beer I can think of – fresh bratwurst and sauteed onions. After chatting up a few friendly locals (including the owner) at the bar, I departed Hood River with a full belly and headed towards the sunset which was now urging me onward towards my destination. A few miles up the road, I turned off of the interstate and onto old U.S. Highway 30 – the modern route’s predecessor. This twisty, two-lane road led me to a natural wonder hidden in a short canyon just a few hundred feet from the Columbia. The mountain streams that feed into the river below sometimes have to plummet more than a hundred feet from the crest of the canyon walls, a consequence of the hard, volcanic rock that makes up parts of the Cascades. These drops have formed a large number of waterfalls along the sides of the canyon, creating a huge natural show for the people who visit the gorge. 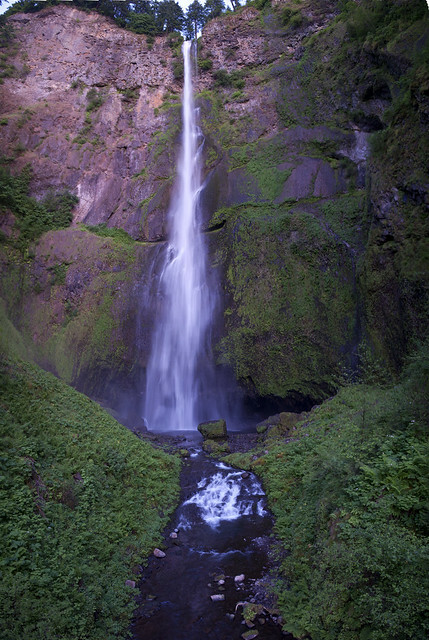 As the sun fell below the walls of the gorge, I ventured out of the car and up a hiking path, seeking perhaps the best-known of the gorge’s cataracts: Multnomah Falls. 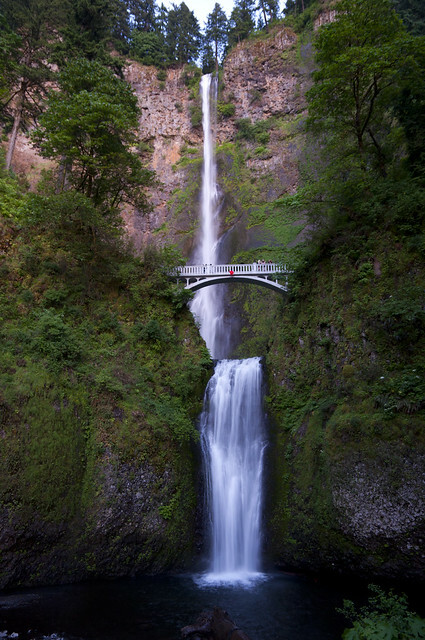 Water from Multnomah Creek falls about 620 feet (189 m) to reach the river in two dramatic drops separated by the 1914 Benson Footbridge. A view of the upper falls. This drop is more than 542 feet (165 m) high! After being in the car for so long, the deafening roar of water smashing into the rocks below was something of a refresher. Also, the normally busy footpath up to the falls was nearly devoid of people, lacking the usual wedding parties elbowing each other out for the prime position on the footbridge. I hiked to the upper falls, just far enough up the trail to make some photographs in the dying light, tempting me to hike the whole trail up to the falls’ source some 500 feet above. This waterfall is amongst the most photographed spots in Oregon, and it’s not hard to see why, even with the wind-driven spray from the falls sprinkling all over my lens. Back down at the road, darkness had begun to descend on the gorge. Headlights on now, I drove west on Highway 30 and into a section of the road known as the Historic Columbia River Highway. This is a very old road, built from 1913 to 1922 in the early years of the automobile. It is carved from the cliffs and box canyons along the river, bending in and out of the increasingly lush forest in a series of sharp, narrow ‘S’ curves and hairpin corners. As I entered the forest, the bluish black sky turned jet black from the tunnel created by the overhanging forest. The boughs grew so thick over the roadway that they wove themselves into a roof in places, making me hit the high beams on my car to stay on top of the curves. The road wiggled up the side of the canyon, making the little Hyundai work much harder than it had yet on this trip. After what seemed like forever, the tunnel ended and I found myself looping up to a distinctively old building at the crest of a ridge overlooking the entire gorge. I had found the observatory at Crown Point, and from up here, the final leg of my journey was suddenly very clear. 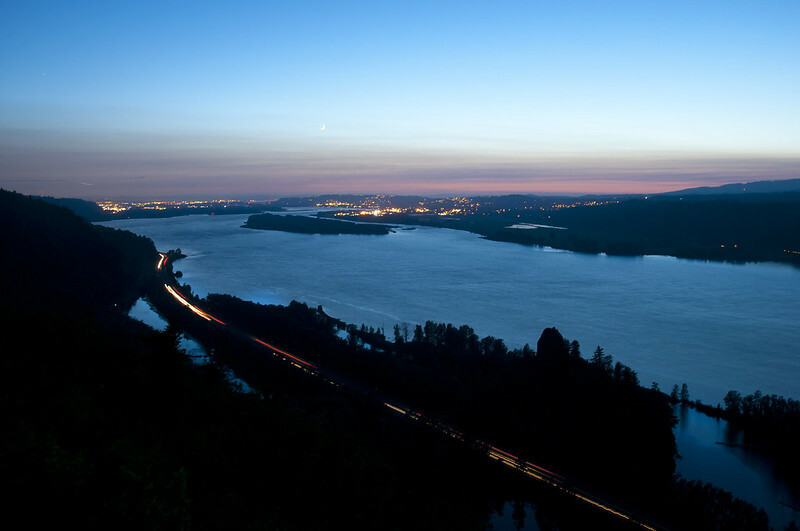 From the point, I could see all the way down the gorge to the lights of Portland and Vancouver, Washington, where the Columbia and Willamette rivers meet. From up here, the gorge which was so tremendously vast looked almost human in scale, and I felt that I could see all the way to the Pacific. Not true; the ocean was still about 90 mi (145 km) distant, and there was yet another mountain range in between myself and the sea, but it didn’t matter from the top of the ridge. From up here, I was like a great lion surveying my kingdom. The next sixty-three miles went by fast, a blur of highway signs and neon as I cruised down I-84 until it ended at the Portland waterfront. The rivers and dense urban structure have forced Portland’s high-capacity freeways onto huge, serpentine tangles of bridges and viaducts above the city. Atop this lookout tower of sorts, I quickly saw that a closer look at this city would have to wait for its own trip. I had planned to spend at least a few hours exploring Portland before moving on to my friend’s house, but after being trapped by the sights of the gorge, darkness had overtaken me. It was now well past 11:30 PM, and I still had at least an hour of driving on various four-and two-lane roads ahead of me. I put Portland to the rear and got my right foot down. McMinnville is a town straight out of the pages of an Americana novel, with a quaint main street and a hardworking industrial and agricultural base. It was the place that my friend had decided to call home for the next few months, a retreat of sorts from the pace of life on the far side of the Rockies. Off of the Interstate for the last time, things slowed down a bit. I reflected with a tired smile on my last four days and what driving alone across the great vastness that is America is truly like. I passed hidden, sweet smelling vineyards and orchards in the night, finally zooming up to the huge Cascade Steel mill that signaled my arrival. On the outskirts of the sleepy town is where I found Travis, rushing out the front door with excitement to see his old friend and his chariot. The beer that I had brought with me from Colorado went down easy between us, and we finally slumped out on the couch after a very warm welcome from my friend and his new roommates. With the car delivered, my mission was at an end, but the next day we’d wake up early to drive the last little bit of road to the Pacific. We headed west from McMinnville to find a place that Travis had been with some friends a few months prior. 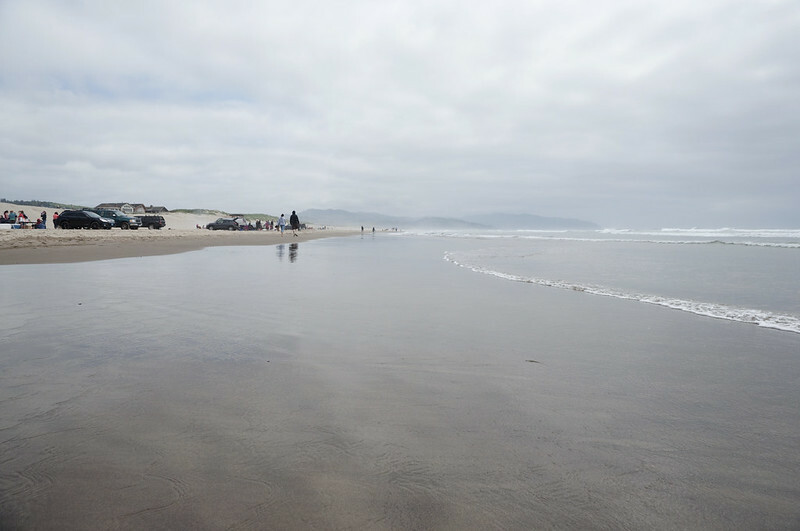 Part state beach, part brewpub, the spot where we would find the Pacific was just a few miles away, north on the legendary Highway 101. The road took us into a forest straight out of a fantasy novel, full of ancient, sprawling trees covered in a bright green moss. I half expected an orc or a dragon to suddenly cross the road in front of us like a deer, stopping traffic only long enough to annoy the locals. Finally, another, smaller road took us a tiny bit farther west, until one final west-facing turn finally brought Travis and I to a parking lot which led down to the beach itself. We had finally done it. We had run out of road. With cold beers in our hands, we took in the ethereal beauty of the Pacific Ocean. The whoosh of the incoming waves was punctuated only by the shouts of a few brave surfers, challenging the icy waters with full wetsuits. 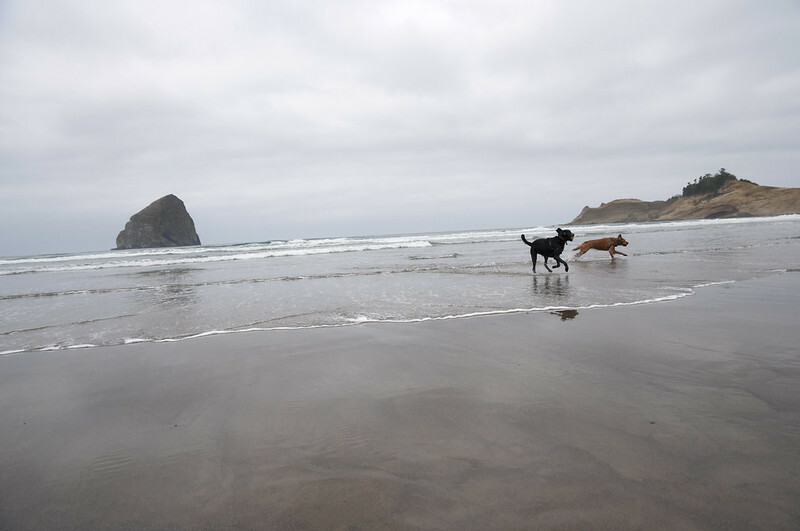 A few happy dogs sprinted up the beach, chasing far-flung balls until they disappeared into the surf. The beaches of the Pacific northwest are different than their better-known California cousins, trading the summer heat and long, sandy stretches of seaside for more isolated, calmer shores. The next morning could only mean the end of my trip, and Travis and I headed back to Portland to use its airport. My return journey across the Rockies would cover nearly the same distance, but would take only two and a half hours. Modern travel has allowed people to cover vast distances in what would have taken weeks 100 years ago. However, one of the most important things to remember occasionally in traveling is this: slow down. My drive through the ‘flyover’ states of the west was one which was full of adventure – and I didn’t even break a wagon wheel doing it. I awoke the next morning at the hostel to a loud jackhammering sound coming from the alley next to my room. It seems the eager street repairmen of Salt Lake City were already hard at work paving the hill outside. No matter, it served as a well-timed alarm clock, and with about six hours of driving ahead, I thought it best to finally rise from my slumber. Outside, I met three young men clustered around a minivan with British Columbia license plates. This van contained an Aussie, a Brit, and a German, all headed from their university life in Vancouver to summer jobs at Yellowstone National Park. They’d been globe trotting for years, and had just begun to scratch the surface of the hugeness of North America. I empathized with them. With a beginning like this, the day held promise. 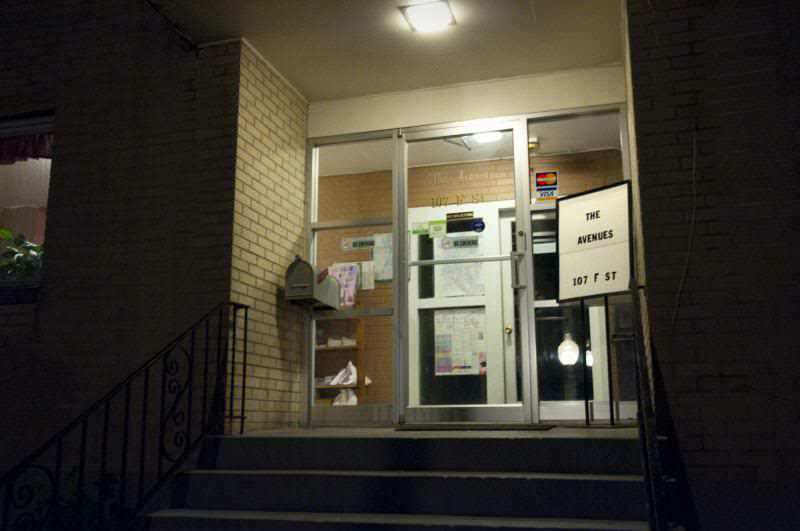 The hostel is located in a neighborhood in north Salt Lake called the Avenues. I had stayed in this part of town a few years prior when seeing a friend who lived there, and remembered a nearby cafe where I could find a strong cup of coffee. The inside was all comfy couches and studious cilentele, reminding me of the place I did most of my heavily caffeinated all-nighters in college. My memory served well, too: the coffee was still strong and delicious at the Cafe on 1st, and with a smile from the barista, I found a couch and settled in for breakfast and a little prep work. My plan was to book a hostel room outside of Boise for my next pit stop, but a call confirmed my fears: no vacancy. No matter, I moved on to finding a suitable place to crash for the night. 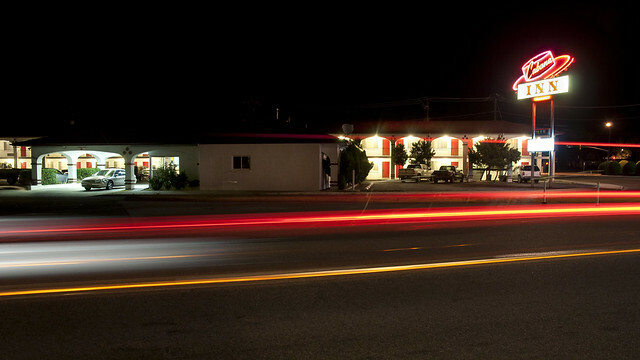 Before long, the Internet had come up with a retro-looking motel near the city’s center. The price was right, and another quick phone call secured me a last minute room. With business done and breakfast down, only a few distractions remained before hitting the road. I don’t consider myself to be an adherent to any particular organized religion, but regardless, I find religious architecture to be fascinating. Often, its intricacy is matched only by the devotion of those within. About a mile from the cafe, I snatched up a rare parking spot next to Temple Square. 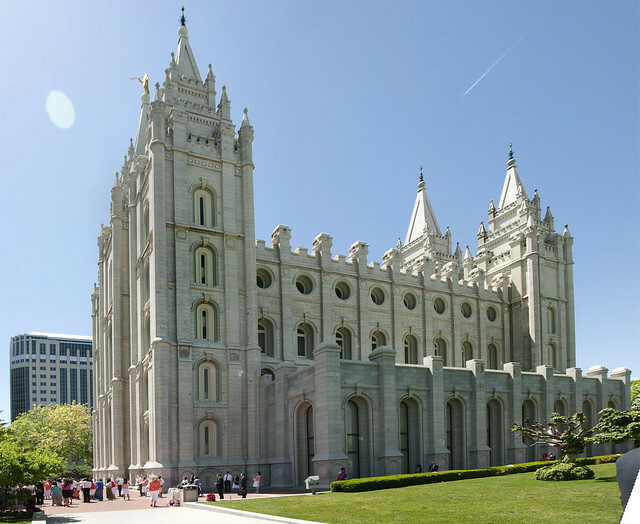 The Salt Lake Temple at the heart of the square is the holiest site in the Mormon religion, and is also the architectural centerpiece of SLC’s downtown. Finally, all in one composite photograph: the Salt Lake Temple. The throngs of glowing newlywed couples and their wedding parties on photo shoots crammed into Temple Square meant getting the whole building in a single picture was a bit more difficult, but with that done, I headed down John Stockton Drive and out of Utah’s capital. About an hour north of Salt Lake City, I turned off of the highway to satisfy a curiosity I’ve had since I was in SLC the last time. During that previous adventure, I never actually got to see the city’s namesake lake. Unlike many large cities which directly adjoin their bodies of water, Salt Lake City is not even within sight of its lake. No doubt the lake’s brackish nature has a lot to do with this; as I drove out onto the long Antelope Island Causeway, an odd, salty odor penetrated the car’s cabin. This road is an anomaly; a long, straight suburban artery that hits the edge of the brine flats on the west edge of the Great Salt Lake and simply keeps going. This part of the lake is shallow enough that no difficult bridge building was necessary, simply a long, raised berm made of small rocks that the road sits on top of. Esme strikes a pose on the Antelope Island Causeway. 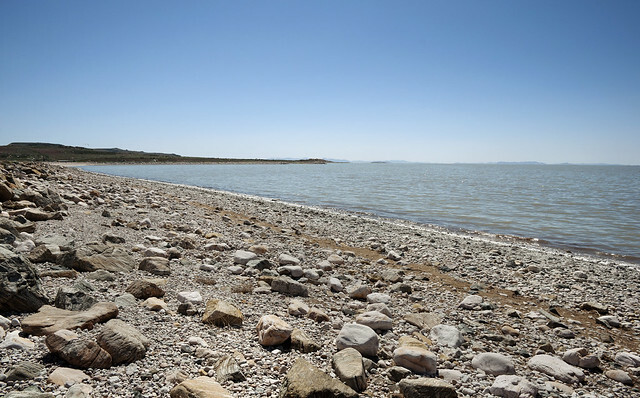 The shores of the Great Salt Lake are bleached bright white by a combination of salt and sun. Looking north from the causeway over the shallows of the eastern lake. This road leads to the largest island in the Great Salt Lake. Called Antelope Island after its native population of Pronghorn, this 15 mi (24 km) long island separates the rest of the lake from Farmington Bay, a shallow arm of the lake that’s used as a wetland wildlife refuge. I headed up into the hills to see if I could reach the top of the ridge – after all, most of the lake was on the other side, and with a drought ongoing, Farmington Bay was more of a shallow salt flat than a lake. I wanted to see if there was any water left in the ‘Great’ Salt Lake. The road that I found was a fantastic one, twisting across the eastern flank of the ridge which runs down the center of the island. It’s two lanes, with old, cracked blacktop worn smooth by big 4×4 tires and years of winter scrapings. This island was used as ranchland up until the late 1960s, when it began to be purchased in phases by the state of Utah in the interest of preservation. It’s now one of the largest state parks in the state, encompassing the whole island. These old roads date from before the state takeover, when they were used to access ranchland and mining claims on the island. Farther down the road, I found a place to park and ascend higher up the ridge. Where this road ended, a trail climbed up the rocks behind the parking lot and into the hills. The end of the road simply meant a change in method; I grabbed a bottle of water and my tripod from the car and set off up the trail for an impromptu hike. The path led up the ridge, snaking around steep ledges and boulders, until it came finally to the top. From the summit, I finally saw it: the rest of the Great Salt Lake! From this summit, I could see as far as Nevada. Later research has said that the exposed rocks at the top of this ridge are some of the oldest on Earth – even older than the ancient rocks at the bottom of the Grand Canyon. It’s easy to see how, with the innumerable twists and folds of eons of pressure and heat inscribing the jagged rock at the summit. A 180° panorama from the top of the ridge. 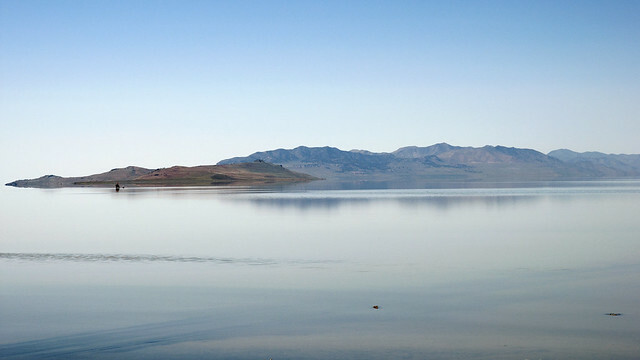 At left (south) is Frary Peak, the highest point on Antelope Island at 6596 ft. (2010 m), nearly 2400 vertical feet from the shoreline below. To the right of the peak are the beaches at White Rock Bay (center) and Bridger Bay. Just above the beach to the right of center (north) are Fremont Island and the Promontory Mountains. Click to view this panorama larger. This 180° view looks east toward the distant peaks of the Wasatch Range. This side of the lake is much drier at the moment, with the shallow salt flats of Farmington Bay on the edges of the remaining lake water. Barely visible at far right at the base of the mountains is Salt Lake City, and in the bottom right corner is the trail I used to come up the ridge. Far below, the lot at the trailhead is visible – Esme looks like a tiny dot from the top! Click to view larger. I hiked back down the trail to the car, passed by a French-speaking couple on their way up who had come a lot farther than I to see the view. Back at the parking lot below, I checked my watch – taking the hike had been worth it, but had come at the price of almost two hours of daylight. With more than five hours still left to drive, the time had come to leave the island. I packed up and headed back across the causeway to the Interstate. From here, I had to head north, through Ogden and Brigham City to the Idaho state line. I pointed Esme down I-15 until it merged with Interstate 84, which I’d follow all the way to Portland. The race against the daylight was on. Looking back the way I came – I-84 finally runs into the mountains at the edge of the Great Basin. A quick pause at the desolate Idaho border before I push on to Boise. Idaho is one state that had eluded me to this point; a place that I admittedly knew very little about. Besides the ‘Famous Potatoes’ advertised on the state’s license plates, I had no real expectations of this sparsely populated western state. As I sped northwest towards Twin Falls, I encountered miles upon miles of green, lush farmland. Exit after exit came with a disclaimer of ‘NO SERVICES’ as the Interstate connected to remote farm roads with no towns to pass through. The farms along the way weren’t just the agricultural kind, either, every so often huge numbers of wind turbines marked the tops of the hills nearby. Idaho has huge amounts of wind power resources, cultivated since the energy crises of the late 1970s forced a change in policy. The state also boasts one of the U.S.’ few online, commercially viable geothermal power stations, as well as huge amount of hydroelectric power – enough that the energy needs of the state are mostly met by these renewable sources. Twin Falls was the next stop, a quick break for fuel and an opportunity to photograph the dramatic canyon of the Snake River. I swung off of I-84 and onto two lane highway headed south, and before long I came to the point at which the highway had to cross this huge gorge. In 1976, the original span built here was dismantled in favor of a new, truss arch style crossing: the I.B. 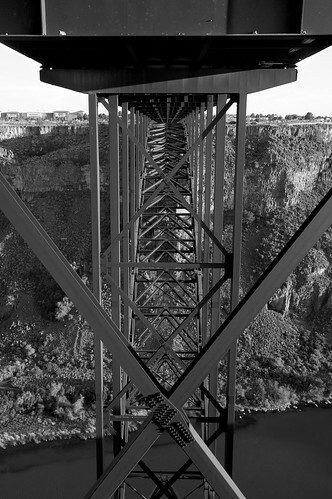 Perrine Bridge. At 486 feet (148 m) above the river below, this bridge is a magnet for BASE jumpers – jumps are allowed here with no special permits required. Even Evel Knievel had a crack at the canyon, making it most of the way across in a steam-powered contraption called the ‘Skycycle X-2’ in 1974. I hiked down the hill to the bridge approach to investigate, while over my back, the beginnings of the sunset turned the bridge’s steel an orange hue. The evening colors extended into the canyon itself, contrasting the golden rocks with the blue-green of the Snake River in the gorge. The Perrine Bridge and part of the Snake River Canyon that it spans. 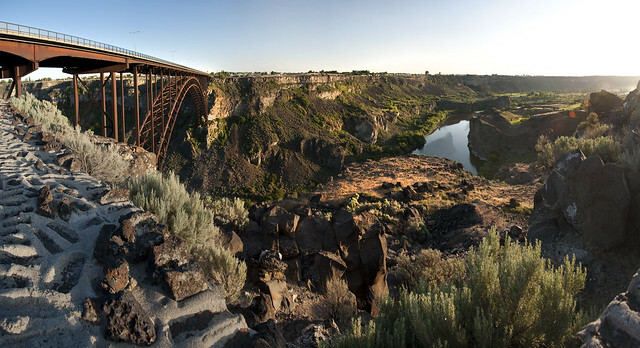 US Highway 91 uses the bridge to enter the city of Twin Falls, named for a series of nearby cascades. A view from beneath the bridge, revealing the steel structure that supports the weight of four lanes of traffic high above the river. The sun finally set as I left Twin Falls. 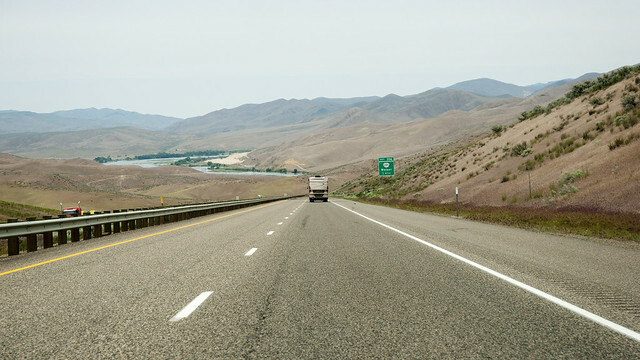 Now, all that remained was the 135 mile stretch to Boise, the largest city in Idaho. The smell of wet earth and cows rolled into the cabin as I dropped the window for a moment. The road was arrow straight for the most part, allowing me to take certain liberties with my speed. Another beautiful sunset drive gave me the opportunity to reflect a bit on my location. Many Americans have little regard for what are sometimes pejoratively referred to as ‘flyover states’. These are the states between the massively urbanized coasts, those where America’s agricultural heart lies. Idaho is proud of this rural way of life, with grain elevators being far more common on this road than tall office or residential buildings. Every so often, a peculiar stand of trees would burst out of the fields of wheat, corn, and soy. After seeing a few of these micro forests, it dawned on me: even the trees were being farmed, planted in neat rows and grown for all of the tasty fruit that we find on our grocery shelves. In an age of growing disconnection with the food we eat, this drive was a stark reminder that no matter the distances between us, we are all dependent upon each other in this increasingly globalized world. As Kerouac would say, I was balling that jack all the way to Boise. I cruised into Boise well after dark, making my way past the Idaho state capitol building to the west side of town where my accommodations for the night were located. I rarely make stops at motels when traveling, preferring instead to enlist locals as hosts when possible. However, after hiking and driving for the better part of ten hours, I was ready for a break. Beckoning me towards it was the neon beacon of the Cabana Inn, a well-kept relic of the late 1960s just five minutes from the center of Boise. I rang the night bell, and a middle-aged woman appeared from the house behind the office where she and her family live. She was kind, if slightly groggy from the late hour of my arrival, and she handed over the keys to a second-floor room with my name on it. I still needed sustenance, so I left the Cabana to investigate downtown Boise. Near the heart of the city, I wandered into the Bittercreek Ale House, a restaurant with a fabulous beer selection and one of my favorite comfort foods on the menu – poutine. Beer, fries, and cheese curds were just what I needed after a long travel day. Boise was being kind to this newcomer. I returned to my bed satisfied and sleepy with a food coma. Sleep would come soon, and all the better, since I had longer ways to go in the morning. The Cabana’s vintage neon sign lights up the night in Boise’s west end. Next time: into Oregon and through the Columbia River Gorge to the Pacific! America is the land of the road trip. Since the dawn of the automobile age, Americans have turned to their cars to seek adventure on the open roads of this vast country. Generations of Americans, from the Beats to the Millenials, have made the road trip part of not only their popular culture, but their collective psyche. The experience of driving cross-country has a grip on America’s collective imagination, and for many including myself, the only way to quell the urge is to hit the road. My previous experience with this phenomenon, my road trip resumé if you will, consists of a multitude of minivan journeys with my family back and forth to Chicago across America’s midwest. Although I’ve been behind the wheel for years, I had yet to drive long distance by myself. My longest stint behind the wheel thus far had been a 500 mile round trip to camp overnight in Colorado’s high country. This was about to change, however. I, too, would take on the journey of a long distance, interstate road trip. Not only that, but I would be doing it for the first time alone. A few months ago, over a beer in Denver, a friend of mine who was in the process of moving to Oregon told me about a dilemma he faced. He and his girlfriend would be driving two cars, both hers, out to their new home from Colorado. My friend’s car would remain stranded in Denver, to be delivered at a later, unknown date. As an answer to his little problem, I volunteered to drive the Hyundai (which he had named Esmerelda) over 1,400 mi (2250 km) from Denver to McMinnville, the town about 40 minutes from Portland where they would be living. The one-way ticket from Portland would save my friend time and money, and given his dislike of driving long distances, it seemed like an obvious choice. Discussion over a few more tasty beers cemented the idea, and thus the gears of an adventure were set into motion. The plan I came up with was to drive to the Pacific over three days. My first leg would normally take me north on Interstate 25 to Wyoming, where I would turn west and go over the easy grades of South Pass through the Rocky Mountains. Instead, I decided to punch straight through the spine of the Colorado Rockies, heading up Interstate 70 and over its high passes and deep gorges, across the vast desert of eastern Utah and up Price Canyon to Salt Lake City. Day two would lead me north, past the Great Salt Lake and up to Interstate 84 through the farmlands of southern Idaho to the state’s capitol, Boise. The third and final leg would be from Boise, across the Oregon border and through the Blue Mountains, up the Columbia River Gorge, and down the valley of the Willamette River to McMinnville. At the end of the road, I had most of a day to spend on the shore of the Pacific Ocean before heading back to Denver by air. It’d be a fast four days, but at the end would no doubt be worth it. It’s not often I get the chance to get my feet wet with salt water. My route through the West to the Pacific. Four days, 1400 miles (2250 km). One morning in May, the time had finally come to hit the road. I had all my supplies: a backpack full of trail mix and water bottles, some hiking gear in case I found something to climb, and of course my camera. All my gear had to fit in one small pack because of my return flight, so packing light was essential. Also on board were a whole road trip’s worth of WBEZ’s This American Life – my plan for the more tedious miles was to use Esme’s three 10″ subwoofers to boom Ira Glass’ soothing voice all over the western US. Today was the longest of the four, a little over eight hours’ of driving separating me from Salt Lake City. After grabbing one last dose of Denver green chile in burrito form, I headed up the hill on I-70 and into the Rocky Mountains. The trip up from Denver, through the Eisenhower Tunnel, and over Vail Pass took the better part of two hours. I decided to stop for a bite to eat near the town of Minturn, about ten minutes from Vail on US Highway 24. Just off the highway, I found a pull off which led back to Minturn’s former rail yard. During the height of Colorado’s mining boom, the rails which pass through Minturn carried thousands of tons of ore, coal, and timber every day. Now, the railway line is only used by hikers and locals out walking their bandana-wearing mountain dogs. I decided to take a short hike up the grade myself, and just a few hundred yards from where I parked, I came across an unusual sight. High above Minturn, a rock formation called the ‘Lionshead’ used to loom over the valley. One night in March of 2013, a huge chunk of rock broke free from the Lionshead, the result of natural geologic forces – eons of weathering and thermal expansion finally caused a crack large and deep enough to give way. With a tremendous crash that must have shaken the surrounding valley, the bus-sized rock tumbled down the side of the hill and smashed into the railway bed at the bottom. 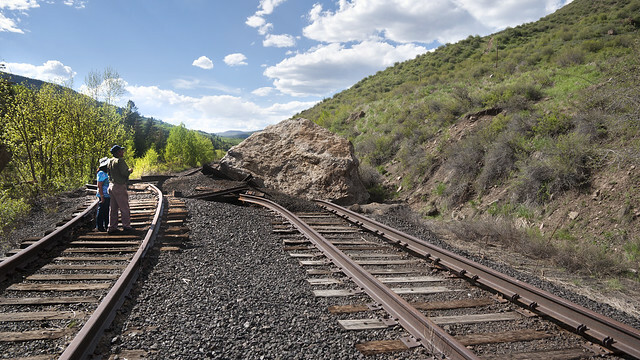 The boulder hit with such force that it dug itself a crater nearly five feet (1.5 m) deep and snapped the steel rails of the Tennessee Pass line like toothpicks. The wide shelf created by the railroad grade stopped the boulder just short of continuing its fall – directly into a few houses just down the hill! Minturn resident George and his wife Claudia examine what he called ‘The Heart of the Lion’ along the abandoned railway grade just above this small mountain town. I’ve lived in Colorado for the better part of my 27 years, and even though I’ve managed to see a fair amount of my home state, the sheer beauty of the Rocky Mountains never ceases to make me gawk. 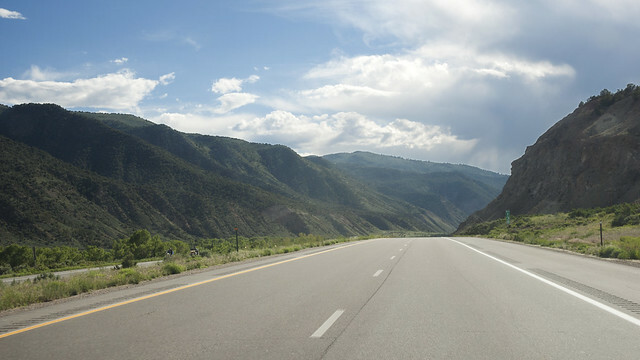 Interstate 70 is the largest, most direct transport corridor in the western half of the state, and it passes through some of the most scenic parts of the Colorado Rockies. Its designers took such pains that parts of this route weren’t completed until the 1990s, well after the Interstate Highway System was finished in the rest of the U.S. The civil engineering that went into this route is staggering; one only has to leave I-70 for mountain back roads for a few minutes to realize how hard a road must have been to build to accommodate four full lanes of 70 mph (110 km/h) traffic through some of the roughest terrain Earth has to offer. As I drove west, the character of the mountains themselves changed as well, with the craggy granite peaks of the central Rockies giving way to the reddish sandstone and limestone of the Western Slope. Westbound through Eagle County, high in the Rockies. 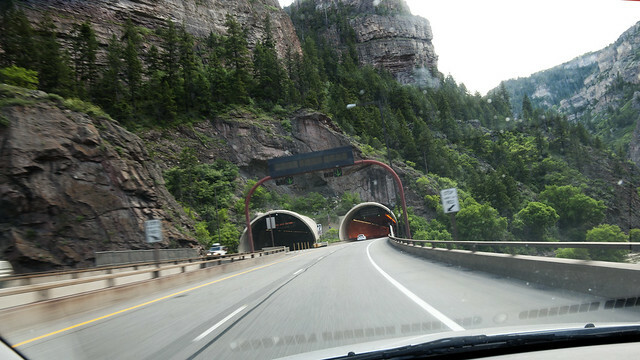 About to pass through the Hanging Lake Tunnel in Glenwood Canyon. A mountain storm brews just west of Rifle, CO. 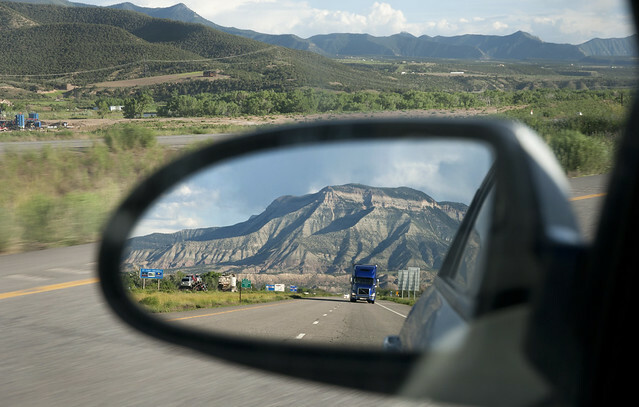 The shadows cast by the flat-topped mountains of western Colorado began to get longer across the highway as I pushed across the spine of North America. Western Colorado is a constantly changing landscape; from the cutting action of the Colorado River, still digging deeper into its gorges, to the innumerable fracking rigs now dotting the landscape in the never ending search for natural gas deposits. Thanks to my detour to the Heart of the Lion, I was growing short on time, and I knew I still had the vast desert of eastern Utah to cross before finally stopping for the night in Salt Lake City. I put the Colorado Rockies in my rear view and ran for the border. By the time I reached Grand Junction, the sun had set and the last rays of light were struggling to poke over the horizon. I paused briefly, taking a walk down by the Colorado River, swollen from the torrent of spring snowmelt coming from the high Rockies. This city of roughly 60,000 people is the last major settlement for roughly 250 miles. Despite the occasional wildfire, Junction has managed to reinvent itself from a former railroad town full of wild west ranchers into the cultural center of its region. It boasts a four-year university, two newspapers, and the mind-bending terrain of nearby Colorado National Monument. I made my first fuel stop before leaving town, brimming the tank before continuing across the immense desert of eastern Utah. I have some experience with this route, but this time, I would be the driver for the crossing. Also, with the last daylight now snuffed out, I would have to make the entire 250 mile (400 km) drive in the dark. This drive is not one to be taken lightly – the nearest town of any size was 70 miles (112 km) away, across some of the most remote landscape on the planet. With one last look across the border of my native realm to the wildlands beyond, I set off across the desert to Salt Lake City. The desert is a strange place, especially after the sun goes down. I found out quickly that with no moon out, one gets the impression of driving through an endless tunnel. The desert at night is, to put it bluntly, very dark. Impossibly dark. So incredibly pitch dark that when I pulled off of the road and turned my lights off, the only thing I could think to compare it to was being inside a mountain – cave darkness. A thin layer of overcast blocked out even the starlight, but with no manmade light coming from the ground to reflect, even the clouds were swallowed up by the warm desert night. I finally found an oasis in the black, a cluster of lights shouting out into the night called Green River. With Salt Lake City still more than three hours away and the clock just past midnight, my body needed fuel to push through the fatigue I was now feeling. 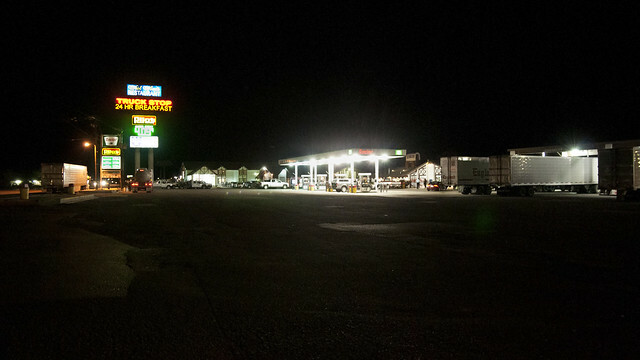 At this hour, the only restaurant open for business was a truck stop diner, that most noble of rural American kitchens. A shining beacon in the night. I ambled in amongst the late-night crowd; some locals that looked like they’d been there every night for weeks (for all I know, maybe they had been), a few bleary-eyed truckers working on piles of pancakes and eggs before hitting the road again. The lone waitress, Bridget, looked as if she had been there since the sun was high in the sky. For everyone in the diner, this was a strange sort of halfway point, and it seemed like everyone had the air of people in transit from one place to the next. After a few cups of coffee and a burger, I was ready to once again head out. 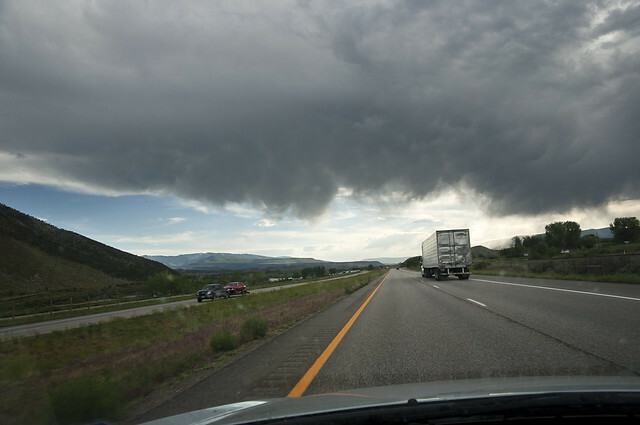 Now, however, I would be leaving the hypnotizing arrow straightness of I-70 for the twists and bends of U.S. Highway 6, a two-lane road which would cut more than 60 miles off of my route to Salt Lake. I drove out of Green River with CCR on the stereo, past a lonely State Patrolman, and up the road towards Price. In the daytime, the scenery outside the car would be distractingly beautiful. This route skirts the edge of a 250 mile (320 km) long desert mountain range called the Book Cliffs. These sandstone cliffs stretch all the way from the rim of a canyon near Grand Junction, and in the night, I had caught up to them again where they were finally cut into by the Price River. It is these weird and wonderful landforms, towering over the flatter earth below them, that gives this place its sort of stereotypical old west atmosphere. The terrain here also helps give this highway a fearsome reputation as one of the deadliest roads in the U.S. I was confident, though, after honing my driving skill for years in the mountains of Colorado. 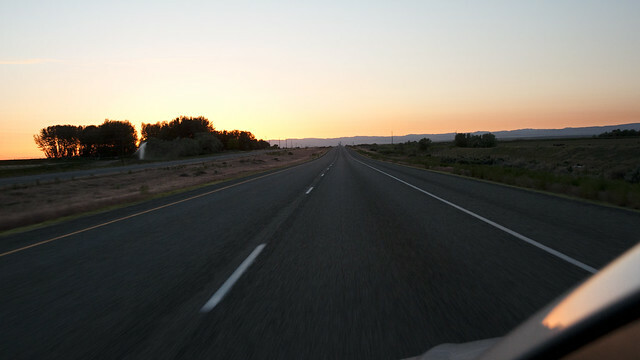 After a little more gas, I drove out of Price and settled in for the last stretch to my hostel bed in Salt Lake. In the night, driving with the windows down, it was hard not to feel alone on this desolate road. I passed through the entrance to Price Canyon at what must have been near 1:30 A.M., Ira Glass’ voice bouncing off the canyon walls as I drove headlong into the twists and turns of the old highway. The desert darkness was back again, but now it allowed my high-beam headlights to occasionally illuminate a tantalizing edge of canyon wall. Though this route carries huge volumes of traffic during the daytime, at night it was nearly unused. Only the occasional big rig passed me by, a few cars trailing behind waiting to make a risky pass in the dark. After what seemed like hours, I emerged from the mountains, the last of the steep ridges giving way immediately to a strange sight: a small wind farm, turbine blades swaying ghostly white in the city lights that now stretched away from the mountains. I was close now; with Highway 6 behind me, I drove north on Interstate 15. The highway slowly grew from four lanes to six, then to eight as I passed through the fringes of Salt Lake’s urban sprawl. 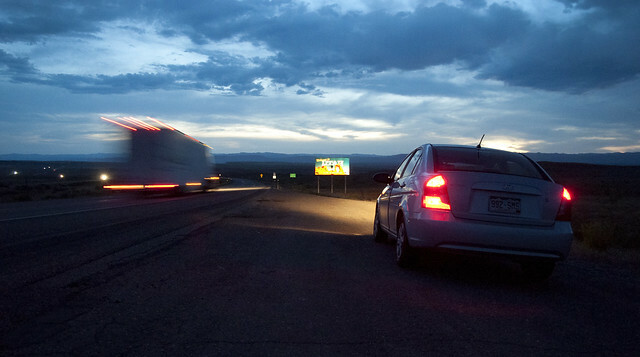 It was now early, nearly 3.30 A.M., and at this hour I had the interstate all to myself. 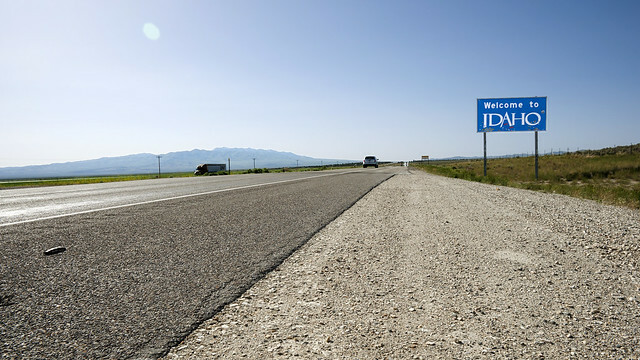 I drove faster than I should have the rest of the way, taking a bit of a liberty on the huge, empty I-15 in the interest of sleeping as soon as possible. Around 4, I finally rolled down the off-ramp into downtown Salt Lake City, exhausted but elated to have finally made it. Sleep would be mine! Finally! Early-morning arrival at the Avenues Hostel. 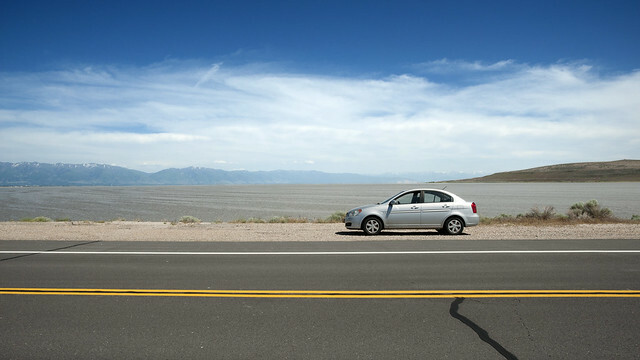 Next time: The Great Salt Lake (it really is salty) and a fast drive through the expanses of southern Idaho.